As the oldest city in Alabama, Mobile has a rich past spanning centuries. French, Spanish, British, Creole, Catholic, Greek and African legacies have influenced everything from architecture to cuisine, creating a miniature melting pot in the Port City. Brush up on your trivia at the History Museum of Mobile, explore the battlegrounds of Forts Morgan, Gaines and Condé, or simply walk the streets of historic downtown. What other place in the U.S. boasts a battleship, a black history trail complete with an Underground Railroad bike tour and a 200-year-old live oak named for a legendary American general? In addition to enriching institutions, such as the Mobile Carnival Museum and Mobile Medical Museum, a number of historic homes on the Bay boast guided tours. 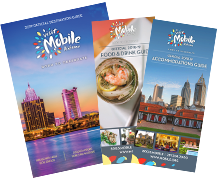 City tours are available just steps from our Welcome Center housed in the History Museum of Mobile, a block from the Mobile River. No matter where you turn, history is right around the corner. History buffs won&apos;t want to miss the impressive History Museum of Mobile. Located in Downtown&apos;s stately Southern Market/Old City Hall building, it presents a permanent collection of highlights of the city&apos;s vivid and lengthy past. The African American Heritage Trail shares Mobile&apos;s multicultural legacy by introducing visitors to over forty historic sites throughout the city. Additional localized exhibits include the "History of Colored Carnival" and an account of the Clotilde, the last known illegal slave ship, which docked in Mobile Bay. Get a peek into the Gulf Coast&apos;s rich prehistory at the University of South Alabama Archaeology Museum. The Mobile Carnival Museum boasts displays on Mardi Gras past, featuring everything from intricate costumes to depictions of early coronations. Perfect for families, the Gulf Coast Exploreum Science Center, bottom left, is host to a variety of hands-on, interactive exhibitions, and an IMAX® theater. Don&apos;t miss out on other historical gems, such as Hank Aaron&apos;s Childhood Home, the Dauphin Street Police Museum, the turn-of-the-century Phoenix Fire Museum and the Mobile Medical Museum. The French established a permanent presence in the Bay Area in 1702 and by 1706 there were at least four permanently established sites on Mobile Bay/River: Dauphin Island, Dog River, Fort Louis de la Louisiane, and the current site of the City of Mobile. Mobile is the oldest permanent settlement in the original Colony of French Louisiana and was its first capitol. The first five governors of Louisiana resided in Mobile and governed an area twice the size of the thirteen English colonies extending from Canada to the Gulf and from the Appalachians to the Rockies. Here in Mobile, in 1703, the first permanent church congregation, of any faith, was established in this vast Colony by the bishop of Quebec with the appointment of Father Henri de la Vente. This congregation continues through today as the Cathedral Parish with records dating back to 1703. The early years of the settlement were accompanied by the establishment of a robust fur trade with the Indians that spread throughout the colony. Along with the development of this fur trade, a trading language was developed. It was called Mobile Jargon and was used extensively until the mid 1800s when the indian population was removed. After the death of King Louis XIV, the Capitol of French Louisiana was moved to the newly established settlement of New Orleans by order of the French Regent, the Duc du Orlean, in 1722. However, the French still valued Mobile. It was a bulwark against Spanish incursions from Florida and English incursions from Georgia. It was also a well established and populated port and trading center for the second largest river system in what is now the United States (note 1). Mobile continued to prosper under the French rule, but disaster struck in 1763 when the French lost the French and Indian War. Mobile, along with all of the other French Territory east of the Mississippi was ceded to England. Spain ceded their part Florida to England, but in return, Spain received all of the Louisiana Province west of the Mississippi, including New Orleans. This transfer of control resulted with the British requiring all citizens of their newly acquired territories, as a requisite for owning property, to pledge allegiance to the King and Church of England. The French population east of New Orleans and centered mainly around Mobile found themselves in this predicament along with the Acadians of Evangeline fame. A large part of the population therefore moved to now neutral and welcoming Spanish owned Louisiana rather than losing all of their possessions or risk becoming a traitor in the eyes of France. By the end of English rule 17 years later in 1780, much of the property and plantations lay abandoned (note 2) and Mobile was ruled by the British from Pensacola. British rule was considered the most inept of the colonial period. In spite of the hardships experienced under British rule, the remaining French population in and around Mobile clung to their heritage with the French language finally passing out of use in the early 1970s, more than 200 years after the British attempts to stamp out or destroy the French culture. Even today, Fat Tuesday or Mardi Gras is still celebrated here as it was in French Times. The Spanish Governor Galvez in New Orleans captured Mobile in 1780 from the British during the Revolutionary War resulting in a more accommodating rule of the multi ethnic population, including the remaining French population. Spanish rule continued until 1813 when the town was captured by the United States under General Wilkinson. This action was taken because of the unresolved issue surrounding the eastern boundary along the Gulf Coast of the Louisiana Purchase made ten years earlier and the heightened Creek Indian unrest and bloodshed in the area brought on in part by conflicts surrounding the War of 1812 and Spain&apos;s suspected duplicity with Britain and the Indians. In 1821 a treaty was ratified completing the sale of Spanish Florida to the United States, thus removing any lingering European claims to Mobile. During this time Mobile received another infusion of French influence in 1815 by way of the arrival of the Napoleonic exiles that settled in and around Mobile. Many of their descendants remain here today. Mobile was now open as an American Port on the second largest river system in the country. At about the same time, the following profound changes were occurring that effected worldwide commerce: the industrial revolution was getting into full swing, invention of the cotton gin, introduction of steam power for river and rail transportation and steam driven lumber and textile mills. These events coupled with opening of the rich river bottom and black belt farm lands for settlement and cultivation and the influx into Mobile of industrious merchants and tradesmen, mainly from new England, South Carolina and Europe created a dynamic mix that resulted in Mobile becoming the third largest seaport in the US for exports by the time of the Civil War and the third largest city in the south. The ravages of the Civil War, followed immediately by the Great Magazine Explosion, that destroyed close to half the commercial district shortly after the war, brought Mobile it&apos;s darkest hour. The climb back to prosperity was slow and difficult. The doubling of import duties to 45% just prior to the Civil War and thereafter all but eliminated the lucrative trade with Europe. The City&apos;s decline was finally arrested by the beginning of the southern lumber boom in the late 1880s followed by the modernization of the river system to support the export of steel and coal production in Birmingham and related harbor deepening and improvements at Mobile. Adding to this prosperity was the birth of the first locally owned and operated shipping fleets in the South. These fleets began as three masted lumber schooners at the turn of the century, progressed to steel hulled square rigged vessels through the World War One period (note 3) and continued with the largest fleet of steamships to sail under the US flag during WW II (note 4). Out of this steamship enterprise and here in Mobile, came the company that launched the world wide containership industry including the construction of their first two container vessels here in Mobile (note 5). The impetus from these shipping achievements is carried on even today with several international shipping and support firms still owned and operated out of Mobile. Recent times have seen an economy that still enjoys healthy growth of its traditional businesses: shipping, port facilities, shipbuilding and repair, forest products, chemicals, oil and gas production and exploration, seafood industry and water oriented tourism and recreation. Mobile is also enjoying robust growth of it&apos;s more recent arrivals: aircraft production and repair and production of steel and steel products. Note 1. The Mobile River System is the 2nd largest river system by volume of water wholly within the United States. Note 2. See description of the Bay Area in the travels of William Bartram, noted English naturalist 1775. Note 3. 1901 - 1918 J. J. Feore of Mobile started and built a shipping company comprised of 23 vessels, seven steel and iron hulled square rigged vessels as well as 16 other three masted lumber schooners and barkentines. In 1913, the Whitney/Bodden family of Mobile, started a 20 ship fleet of lumber schooners that lasted until the mid twenties. In 1914, the Scott Brothers started a fleet of 6 lumber schooners that lasted until about 1924. According to Lloyds and the American Bureau of Shipping, no other southern ports could claim ownership of shipping fleets during this period. Note 4. 1919 saw the beginning of Waterman Steamship Company. This company grew to have the largest number of vessels sailing under the American Flag at the end of World War Two. Note 5. Waterman was later purchased by McLean Industries and it was here in Mobile, that McLean started the world wide container shipping industry through the establishment of the Sea/Land Corporation.